Is the volume of inbound security alerts outpacing the investigation and response capacity of your team? If so, you are not alone. Many organizations are looking for ways to bridge their talent gap, work more efficiently, and respond to threats faster. Join this recorded panel discussion to hear the journey of two teams who are using the Splunk Phantom security orchestration, automation and response (SOAR) platform to mature their operations. Countless platforms promise predictive capabilities for your IT organization. What is your strategy for integrating artificial intelligence and machine learning, and what do you need from your tech stack to be successful? Watch our webinar with Vodafone and Accenture to understand the 5 critical components to build an effective AI strategy, benefits realized from implementing a predictive IT solution, and what to look for when evaluating predictive analytics solutions. Jae Lee, Director, Product Marketing, Splunk, Inc.
Security teams are underfunded, understaffed and overwhelmed by constantly putting out fires. They struggle to deal with threats and attacks, while having to answer hard questions from management. Everyone is demanding detailed, accurate answers about cyberthreats and risk and compliance – and they all need answers NOW. So, how useful is it to know that you’re not alone, since others are in the same boat? The answer is “not useful at all.” What IS useful, is knowing how to work smarter and get answers faster. This webinar will provide demo examples of how to ask questions of your machine data to get security insights. For example, we will explore whether login behavior looks suspicious the root cause of how an attacker entered your network. We’ll show how you can get to investigative findings quickly and make use of those answers just as quickly. This webinar aims to help security teams learn how to stay focused on solving security problems faster so they can get ahead of it all. Jae Lee, Director, Product Marketing, Splunk Inc.
For security teams, having the ability to investigate a security incident quickly and accurately is still the most fundamental skill needed to combat the majority of cyberthreats and attacks. The average organization is being attacked on a weekly basis, without the right processes and tools in place to pinpoint root cause without delay, and put the right countermeasures in place in time to minimize damage. We will provide a methodology to help you align how you think about your organization’s security processes – the goal is to help you develop an investigative mindset that addresses a broad range of security and compliance concerns, in a pragmatic and targeted manner, specific to your own needs. From falling costs in automation hardware, a boom in manufacturing and the explosion of Machine Learning — the Industrial IoT market is at a turning point. Watch our Industrial Internet of Things webinar and learn about how the latest tech-trends are impacting Manufacturing, Oil & Gas, and other industrial companies. IoT thought leader, Stanford Lecturer and Alchemist Accelerator Chairman Timothy Chou will be discussing the latest developments around predictive analytics and its impact on the future of industrial operations. Watch today and see how Splunk can help drive valuable intelligence from your sensor and machine data. This webinar includes a demo. You’ve heard about the top trends in IT - but how do you use this information to take meaningful action? How do you encourage collaboration between the business, developers, and operations? How do you up-level IT as a service provider that reduces manual processes and troubleshooting without context to focus on strategic initiatives that impact important KPIs? By avoiding these 8 mistakes IT practitioners makes! You’ll walk away with an understanding of how to apply lessons learned to your own organization and operate maximum scale! Assessing and monitoring basic security posture is critical. Security teams need the ability to identify and alert on a particular type of malicious activity, AND determine whether that alert is meaningful in a broader context. - How secure are my endpoints? - What is happening on my network? - Where is it most critical for me to apply updates? - Are user accounts configured properly? - Is there any suspicious traffic going out? - How is overall security posture in my AWS environment? This webinar is perfect for organizations that are just getting started with formalizing their security operations. We’ll show you how with Splunk Security Essentials, a use case framework tool that you can download and stand up quickly to immediately glean security value using your own data sources. Watch this short video demonstration to learn how Splunk Enterprise Security helps security practitioners detect, investigate and respond to internal and external attacks by simplifying threat management while minimizing risk to safeguard your business. Welcome to the Splunk for Security Investigation Experience. In this video, learn how you can harness the power of analytics to easily detect hidden anomalies in the endpoint, so that you can prevent and mitigate advanced malware such as ransomware. Join this live 1-on-1 interview with James Hodge, Area VP, Field Technology at Splunk for an in-depth discussion on how to successfully leverage Splunk in Containers. - What is the specific value that Splunk brings to the AWS customer? - Why use containers in the first instance? - What are some recommended use cases for running Splunk in containers? - How would you start thinking about migrating to Splunk or other applications to Cloud? This interview will be filmed live at AWS re:Invent in Las Vegas. Tun in for live Q&A and get all of your questions answered! ● AI & ML approaches – what’s right for you? Diese Session wird live aus Nürnberg übertragen. In diesem exklusiven Panel diskutieren Top-Branchenexperten, welchen Einfluß digitale Informationsinitiativen auf Sicherheitsstrategien haben können. - Welche Cyber-Risiken sind mit Initiativen zur digitalen Transformation verbunden? - Welche Rolle spielt das IT-Sicherheitsteam bei digitalen Transformationsprojekten? - Was sind die benötigten Kernfähigkeiten, und welches Umdenken ist in den IT-Sicherheitsabteilungen erforderlich? - Welche Technologien unterstützen dabei? Ron Peeters, Managing Director, EMEA, Synack Inc. Die 'Ask the Expert' Sitzung wird Ihnen live in DEUTSCH aus Nürnberg zur Verfügung gestellt. In diesem ausgewählten Panel stellen Top-Branchenexperten vor, wie Sie Ihr digitales Sicherheitsprogramm stärken - von der Verwaltung der Sicherheitstools bis zur gelebten Sicherheit. - Warum reicht es nicht mehr aus, nur Sicherheitswerkzeuge zu implementieren und zu verwalten? - Was sind die Herausforderungen bei der Entwicklung eigener Sicherheitsfähigkeiten und Security Intelligence? - Was sind die Reifestufen, um dorthin zu gelangen? - Welche Personen (Know-how) / Prozesse und Technologien werden für den Erfolg benötigt? Matthias Maier ist Technical Evangelist für Splunk in EMEA und verantwortlich für die Kommunikation von Splunks Go-to-Market-Strategie in der Region. Er arbeitet eng mit Kunden zusammen, um zu verstehen, wie Maschinendaten neue Einblicke in Anwendungsbereitstellung, Geschäftsanalyse, IT-Betrieb, Internet of Things sowie Sicherheit und Compliance ermöglichen. Matthias hat ein besonderes Interesse und Fachwissen in Sachen Sicherheit und ist Autor der Splunk App für IP Reputation. Zuvor arbeitete Matthias bei TIBCO LogLogic und McAfee als Senior Technical Consultant. Er ist regelmäßiger Redner auf Konferenzen zu einer Reihe von Themen rund um Enterprise Technologien. - What role can predictive analytics play in a DevOps based organisation? - What role does predictive analytics play in AIOps? - What are the enablers for predictive analytics? Imagine a world without outages. Glorious, isn’t it? We’d like to help you get there. So how do you stop IT events before they escalate into outages? With a little help from machine learning. 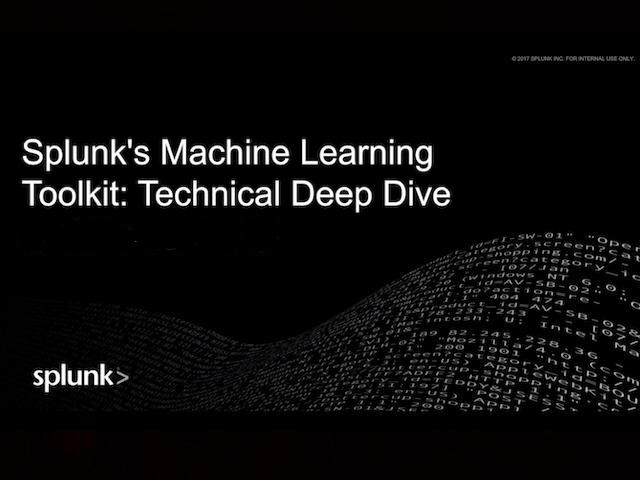 The predictive capabilities from the Splunk Machine Learning Toolkit (MLTK) combined with the Event Analytics capabilities in Splunk IT Service Intelligence (ITSI) give operations teams like yours the opportunity to proactively act on an event before it becomes an outage. Whether your current IT state is reactive or you’re already in a somewhat proactive state, these predictive capabilities will be something you’ll want to take note of! You’re a CIO, CISO or DPO - and you’ve been woken up in the middle of the night because personal data held by your organization has been discovered for sale on the dark web. This disclosure puts the privacy of your customers at risk. What do you do next?